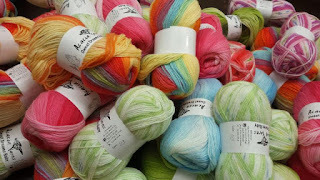 New for September is the arrival of Cascade Yarns including Cascade 220, Cascade 220 Superwash and Ecological Wool at the Yarn and Fiber Company. All priced competitively and will get our normal worldwide free shipping terms. We have in stock over 150 colors of 220 and this is growing week by week, we hope to have the entire line in stock within the new few months. The picture shows just a part of the total colors we have available!